Height 5 feet 2 inches. Weight 126 lbs. Chest measurement 33-36 inches. Complexion red. Eyes blue. Eyes both 6/6. Hearing and colour vision both normal. Limbs well formed. Full and perfect movement of all joints. Chest well formed. Heart and lungs normal. No illnesses. Free from hernia, varicocele, varicose veins, haemorrhoids, inveterate or contagious skin disease. Vaccinated. Good bodily and mental health. No slight defects. No fits. Timothy Joseph Breen, known as Tim to the family, was the eldest son and one of a nine children born to John and Mary (née Lynch) Breen, of Levels. He was born on 9 February 1893 at Timaru and baptised on 14 February at St Joseph's Catholic Church, Temuka. John Breen hailed from County Kerry, Ireland, while Mary Lynch was born in London, England. With two older sisters, Catherine (Katie, Kitty) and Hannah (Annie), and his brother William (Bill), he attended Seadown School before transferring to the St Joseph’s Convent School at Kerrytown. In 1900 at Seadown School Tim was awarded the junior (Standard I) writing prize, presented by the school mistress. The prize-giving was held after the annual picnic and sports in Mr Campbell’s plantation. “Tim and his brothers and sisters walked to school from Levels to the Kerrytown convent school run by the Sisters of St Joseph. They were very bright with mental arithmetic and left school quite young as there were 9 children in the family,” writes Tim’s niece [11 September 2017]. Breen Road at Levels is named for this family. Young Tim met with success in the ploughing match held at Washdyke in late August 1911 for competitors from all parts of South Canterbury, when he finished in third place for Class D, plain ploughing, for youths under 19 years. “The details of the Levels Red Cross Committees Festival make interesting reading and show that patriotic generosity abounds in the Levels district,” reported the Timaru Herald of 19 July 1915. Among those who contributed to the Red Cross Fund through their sales were John Breen – 12 shillings, and T. Breen – 7 shillings. 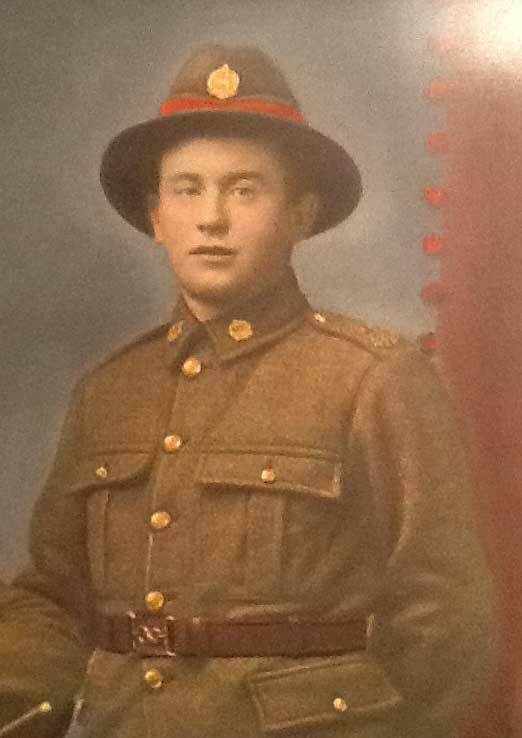 Less than a year later Tim’s father was angry that he was enlisting as he didn’t want his son to go to war, recalls another niece of Tim [7 September 2017]. Perhaps John Breen was fearful or had a premonition. It is believed that Tim thought he would get to visit ancestral homes in Ireland when on leave. On 3 May 1916 T. J. Breen, a member of South Canterbury’s quota for the 16th Reinforcements, left Timaru by the express for Trentham, after being entertained in the Stafford Tea Rooms by the Timaru Ladies Patriotic committee. After falling in and being addressed at the Drill Shed, the men proceeded to the station, led by the 2nd South Canterbury Regimental Band. Thus, Timothy Joseph Breen, a twenty-three year old farm hand at Levels, enlisted in May 1916. While on final leave from Featherston camp, in mid July 1916, Private T. Breen was treated to a send-off in the Washdyke Hall. This was the first function arranged by the recently formed representative committee at the Levels for the purpose of farewelling local volunteers and giving them a fitting reception on their return. Sadly, Tim would not return. The chairman of the Levels Soldiers Entertainment Committee “made a few practical and forcible remarks on the self-sacrifice and patriotism of the guests of the evening in volunteering for the front to help the Empire.” The soldiers were presented with mementoes of the occasion from their many friends at the Levels, and they were complimented on the step they had taken. “The farmers, too, had to exercise some self-sacrifice in seeing such useful men leaving the district.” No doubt, John Breen was one of those farmers so affected. The spokesman wished them a good time and a safe return, then presented a handsome set of ebony military hair brushes and a sovereign belt to each of the soldiers, who responded in brief and patriotic speeches. A most enjoyable social evening followed, with music, solos, recitations, dancing, and a plentiful supply of refreshments. Private T. Breen and Trooper D. Brosnahan left by the second express on the Saturday following. A large number of Levels friends gathered at the station and gave the departing soldiers three hearty cheers, as the train moved off. Of quite small build (standing at only 5 feet 2 inches and weighing 126 pounds), Timothy was. nevertheless, in good physical condition, although he had previously been rejected as being 33% unfit. He named his mother as next-of-kin. At Featherston Camp he had a stay in hospital, with influenza. With the 7th Reinforcements, 3rd Battalion, he embarked on 21 August 1916 from Wellington on the “Mokoia”, destined for Plymouth, England. At Sling in October he was posted to the Rifle Brigade, with the rank of Rifleman, before proceeding overseas. Suffering from tonsillitis in May 1917, he was evacuated to hospital. On 12 June 1917 he was wounded – gassed - and admitted to hospital, as reported in Casualty List 614. A week later he rejoined his unit. The next report - a very long casualty list - was the last. Rifleman Timothy Joseph Breen, 21778, of Levels, died of wounds on the 12 October 1917 in Belgium (“Somewhere in France”), aged 24 years. In fact, he died at Passchendaele, when he was hit in the stomach and died on his way down. The informant saw him wounded and heard of his death from the stretcher-bearer. He is buried in the Tyne Cot Cemetery at Zonnebeke, another victim of the Passchendaele tragedy. Tim Breen was a very popular young man and well known throughout the Levels and Kerrytown districts, and described as a good, practical Catholic. He was survived by his parents and six siblings – Kitty who married returned soldier Michael Hanifin, Annie (Mrs McGartland), Bill who had been called up, Jack, Mick and Joe. His sister, Mary (Molly), had died on 23 May 1917, aged 20 years, at Nurse Shanks’ Private Hospital in Timaru, and the youngest, Julia, died in infancy. For some years after the family inserted In Memoriam notices in the New Zealand Tablet, for Timothy and Mary – “In sad and loving memory . . . .” Poignant notices appeared in the Timaru Herald – “Far away in a foreign soil A loved one from our home is laid, Though too far his grave to see, He lives to us in memory, We do not know what pain he bore, We never saw him die, We only know he passed away and never said good-bye.” . 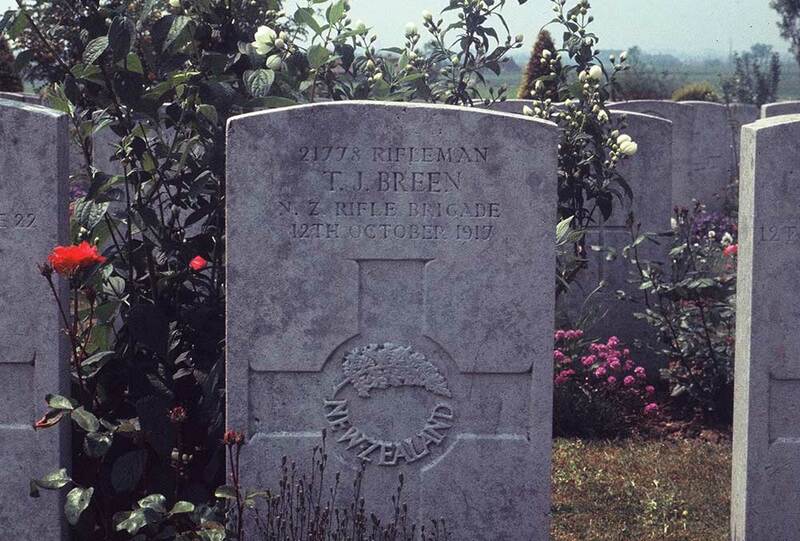 A photo in the Tablet of 11 January 1918 depicts a youthful yet apprehensive Rifleman T. J. Breen. Just a few lines to let you know that I received your most welcome parcel alright. The cake was very nice but it was very funny about the cigarettes. The rats put a hole in my pocket and took them away the night I got them, but I had one packet smoked. Tell Bill that I have given some smokes to Hughie Brosnahan……. “Dear Mother please make sure that you have access to my bank account if anything happens to me. His medals – British War Medal and Victory Medal – were sent to his mother, while the plaque and scroll were sent to his father. Timothy Joseph Breen is commemorated on the Timaru War Memorial Wall, the Washdyke War Memorial and the Timaru Sacred Heart Basilica Memorial. And he is also remembered on a stone in the Temuka Cemetery, the burial site of his sisters Mary and Julia, and later of his brother William John. The Washdyke Memorial – a shaft of New Zealand granite with a spire 20 feet high – bears the following inscription: “In grateful memory of the Levels and Washdyke men who gave their lives in the Great War, 1914-1918” followed by the names, among them T. J. Breen. This memorial was unveiled by the Hon. James Craigie, M.L.C., on 10 June 1923. The Battalion Band was present and the hymn “O God, Our Help in Ages Past” was sung. The memorial was the local headstone to those men who had saved the country in a time of grave danger, said Archdeacon Jacob. “It spoke eloquently of sacrifice and service.” The Hon. Craigie said that “his sympathy went out to all relatives of men whose names were engraved upon the stone. We had sent over the seas 100,000 men, and had lost some 17,000.” Twenty-seven men had left the Washdyke and Levels district, and seven had made the supreme sacrifice. The ceremony concluded with the singing of the hymn “Nearer, My God to Thee” and the “Last Post” played by the bugler.